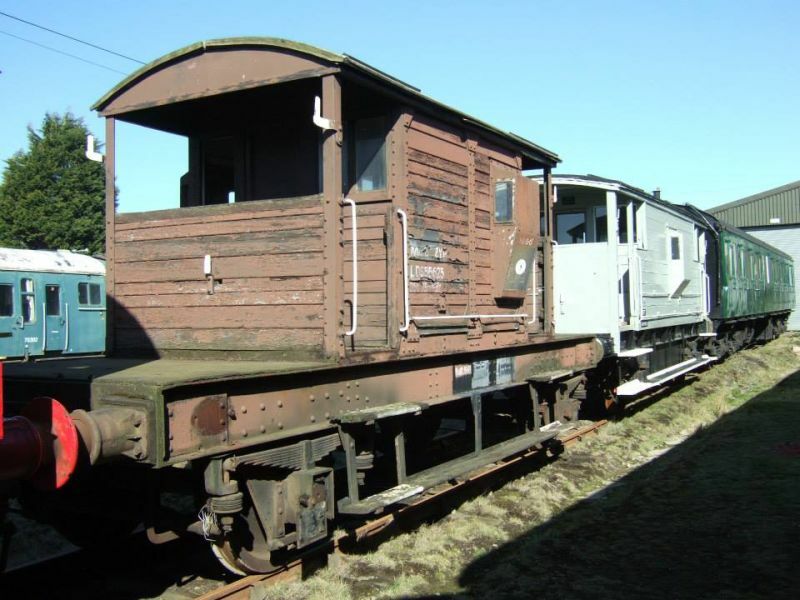 LDS55625 is a Southern Railway style 25 ton brakevan, actually built by British Railways in the early months of nationalisation in 1948. 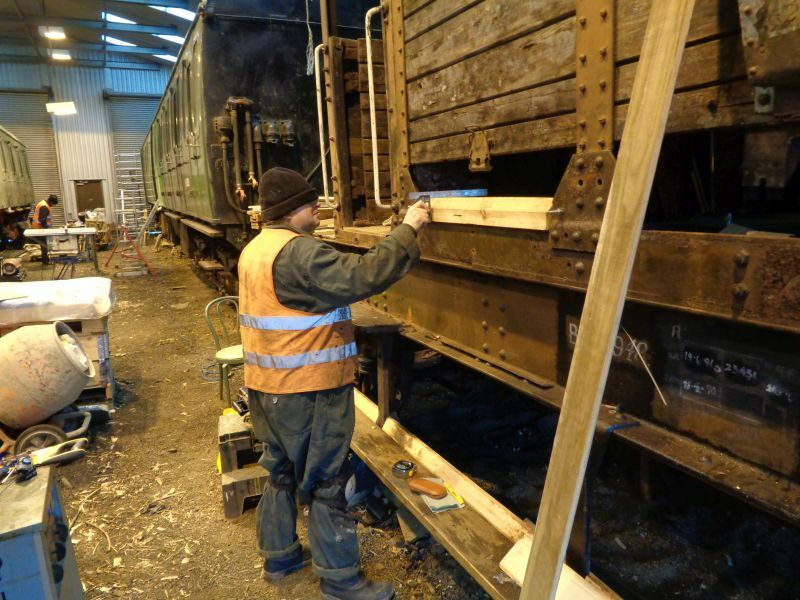 DRSA acquired it in 2011, but immediately discovered faults which were beyond the limited experience of the C&W volunteer team to repair, and it languished untouched and unloved at Meldon. In spring 2016 we took a deep breath and started work. 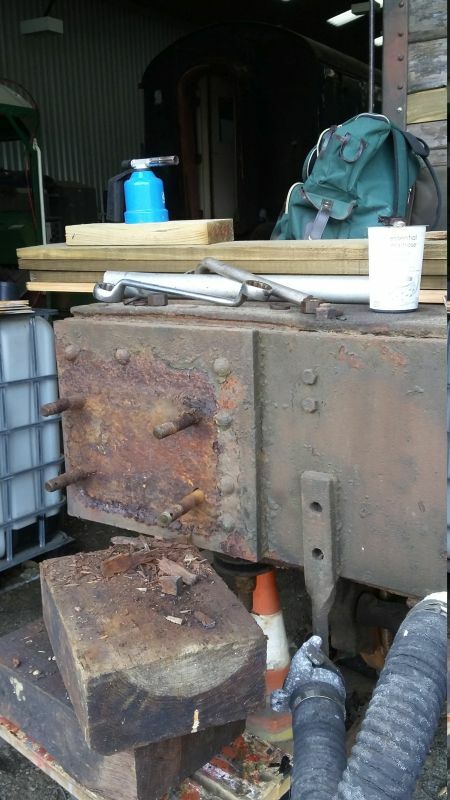 Known problems were a missing axlebox bearing, 2 axleboxes which had been bent by jacking under them without anything to spread the load, a missing brakeblock of an uncommon design, a roof which let in water and needed re-covering, a fair amount of rotten wood and just a touch of rust. 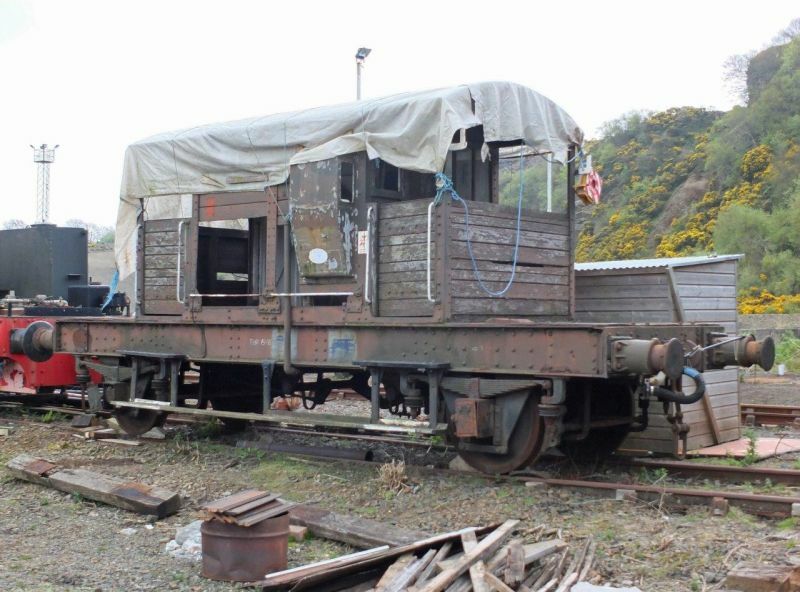 The van dumped at the back of the Meldon workshop before work began. The stuff hanging down from the roof is the canvas roof covering which wasn't stuck down properly and has somehow shredded itself. 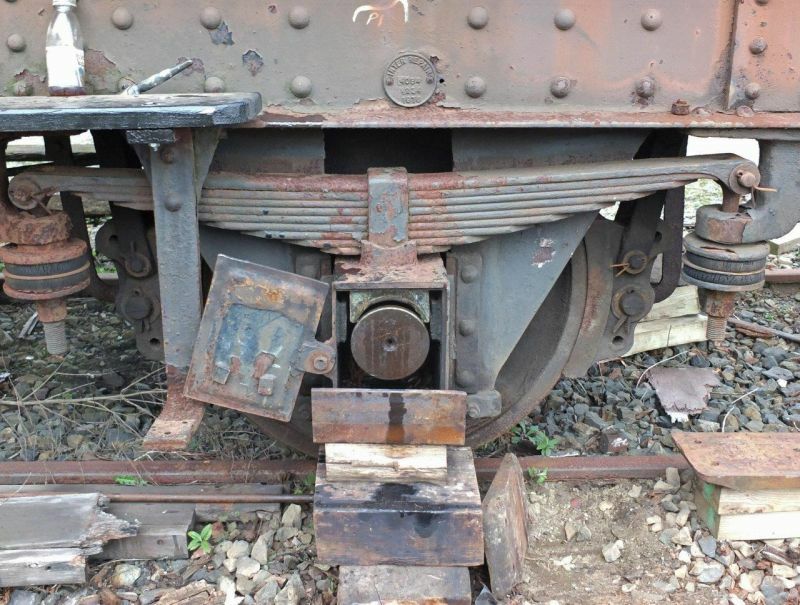 Axlebox showing bearing and retaining plate above the axle, and oiler below. 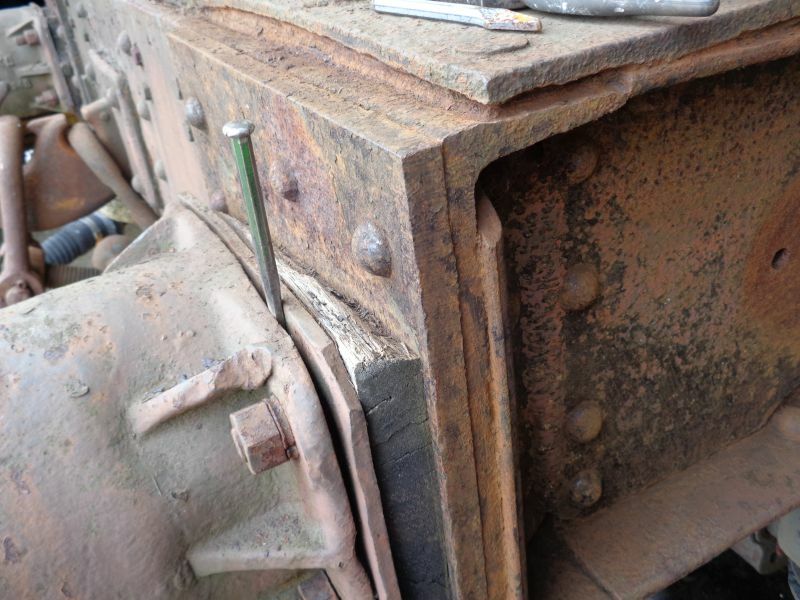 Unfortunately the bottom face of the axle box is bent where it has been jacked without anything to spread the load, thus slightly crushing the oiler and restricting the vertical movement of the box necessary to remove the bearing. 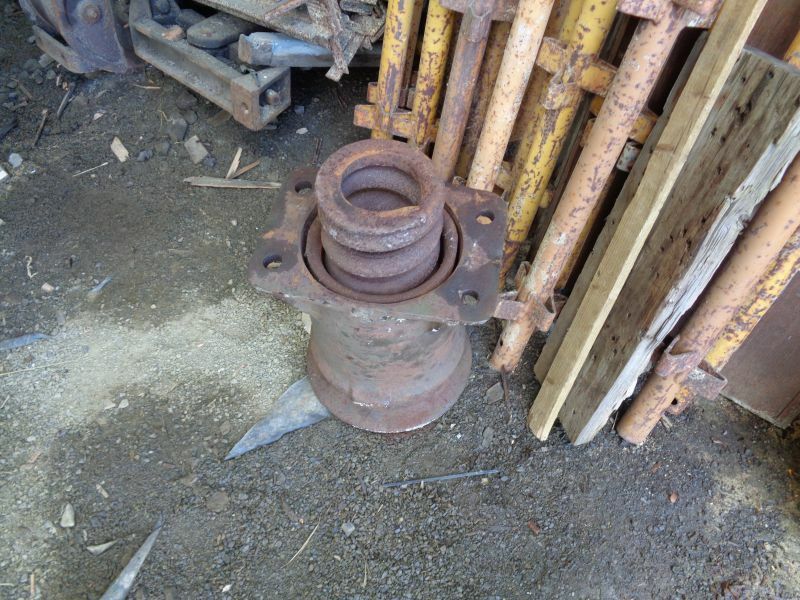 The other box on this axle is in the same condition. Another axlebox problem. No bearing. The top of the axlebox is sitting directly on the axle. 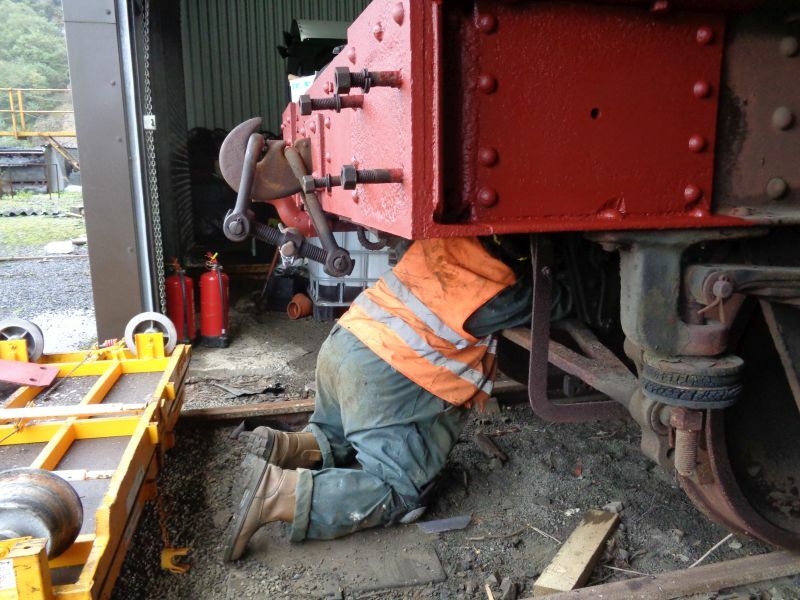 After a number of false starts we figured out how to get the bearing out of the one good axlebox. It's marked 'BRSTD 10x5' and 'LG4 SW1'. We understand this means the journal is 10" long and 5" diameter. LG4 is a grade of bronze. SW1 describes the white metal. Another view of the axlebox bearing, showing the white metal bearing surface. Disappointingly the van is missing a brake block, of what looks like an unusual design. View of some of the brake mechanism. 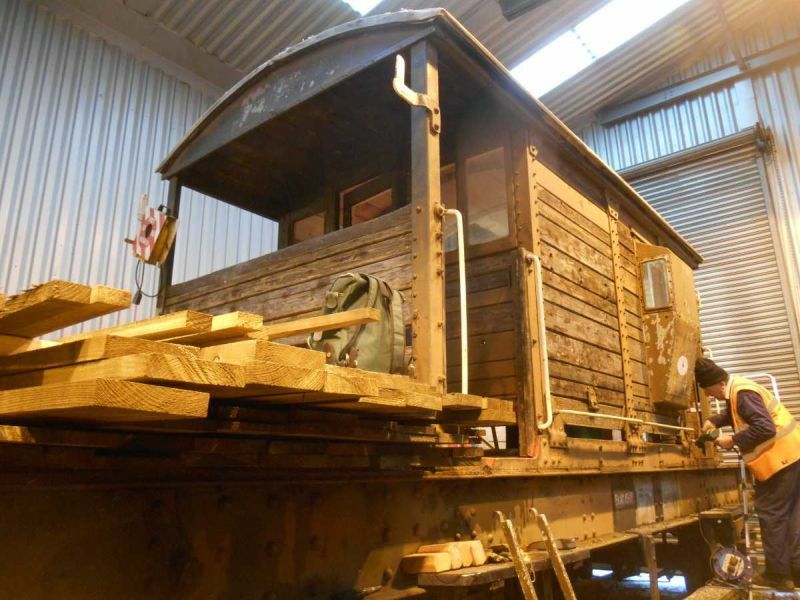 It doesn't look much like progress, but getting the roof sheeted over means that LDS55625 is waterproof at last, and the interior should start to dry out. Note that some of the steps have been renewed, to provide safer access. 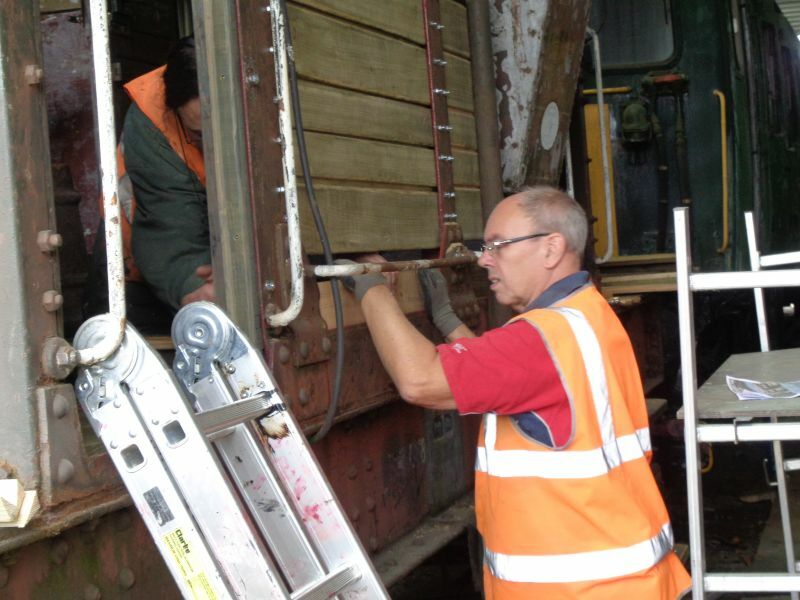 Today's session saw us remove a brakeblock as a pattern for identifying a replacement for the missing one. A thorough search of Meldon yielded nothing like it, so if anyone knows where we could acquire more (pic below) please let us know. The same search yielded a cache of the correct oilers, so we have replacements for the ones crushed in the bent axleboxes. 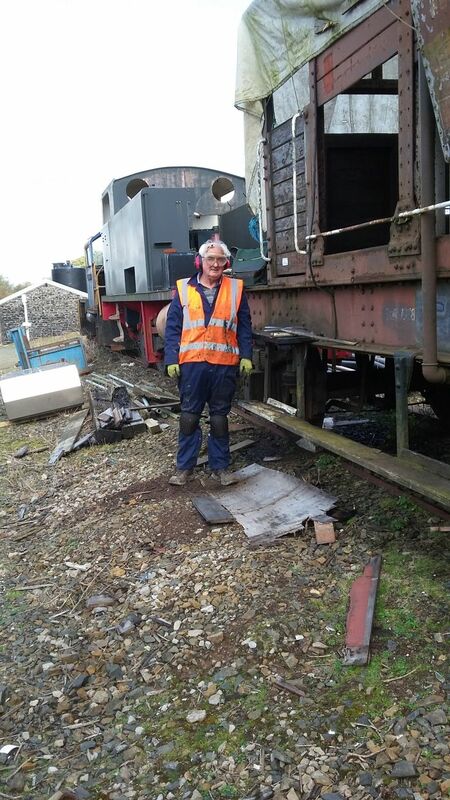 We were pleased to have occasional SMT volunteer Mark Williams with us, and Mark spent much of the day poking around under the van, having discovered that the substantial ballast compartment was full of water. Eventually Mark found and unblocked a couple of holes, and we left the van draining. Mark also spent some time clearing detritus from the van's interior and this, coupled with the drying out resulting from covering the roof, has considerably improved the working environment inside the van. This is one of the van's brakeblocks. One is missing, and one or two others may need to be replaced, so if anyone knows where we could acquire some, please let us know. There are some markings on some of them, but nothing we can decipher. 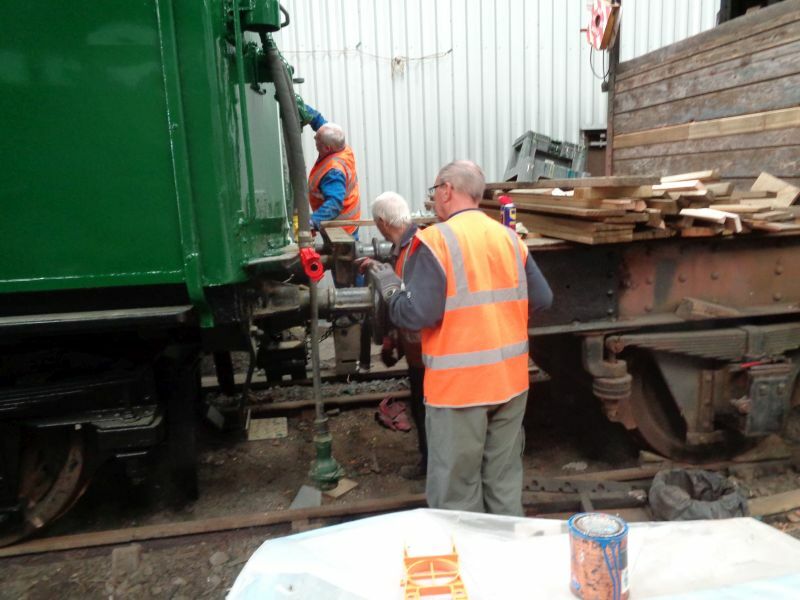 For a few weeks we have been debating how to deal with the bent axleboxes. 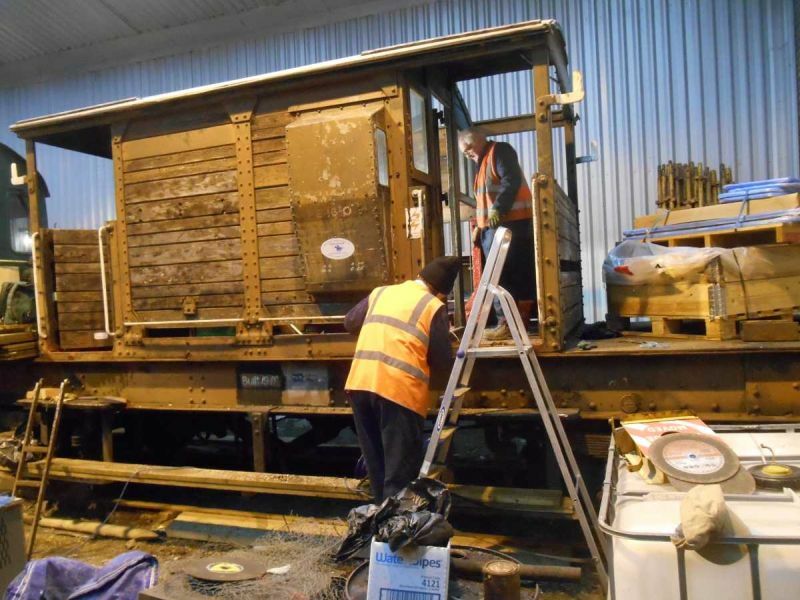 One school of thought was to jack up the van and remove the wheelset, making it easier to remove the unloaded boxes so they could be repaired on the bench. 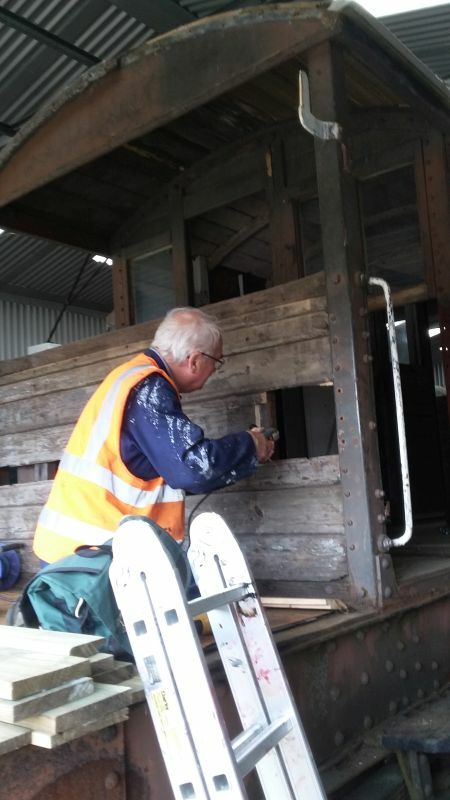 However, we were a bit nervous about jacking a 25ton van quite so high, so today John Coxon took an anglegrinder to one of the boxes and cut off the bottom plate. This allowed us to remove the crushed oiler. 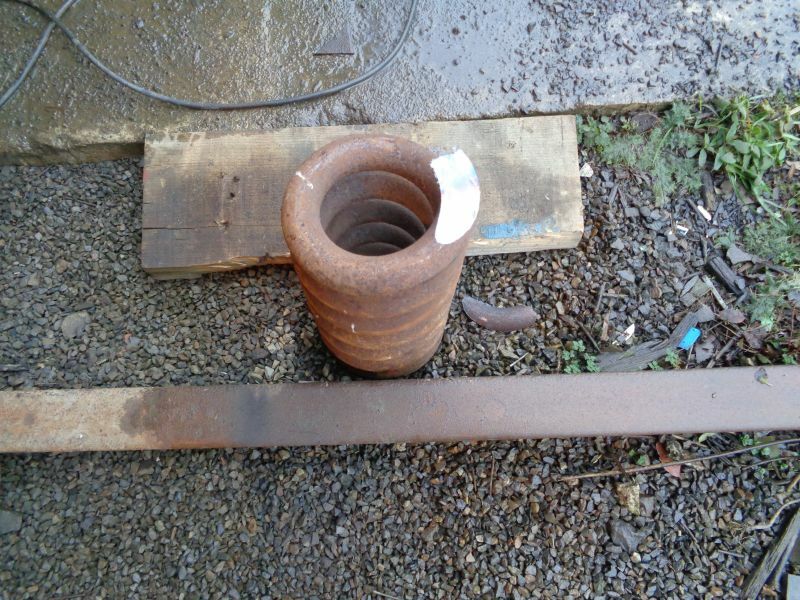 The next step will be to straighten the plate and the stub left on the box, then weld the plate back in place. 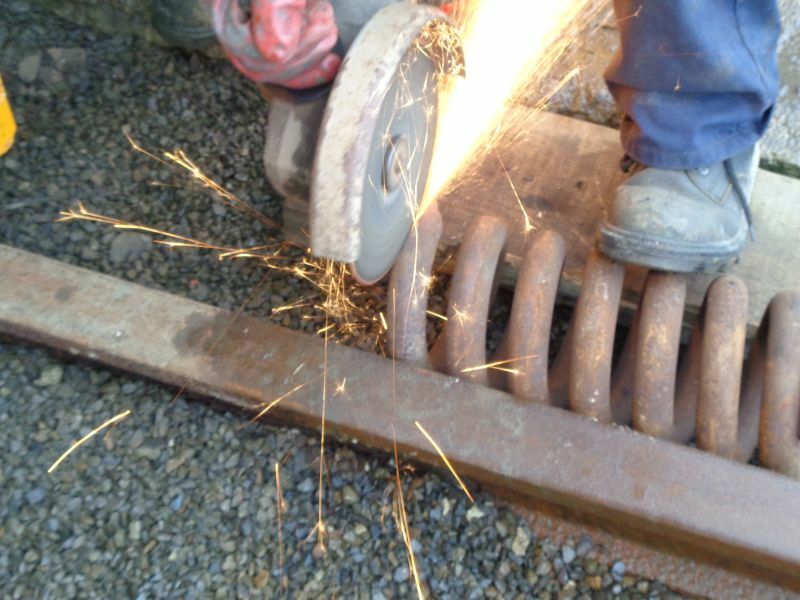 The welding will be slightly awkward, but the rest of the job should be straightforward. All the bottom plate does is keep the box square and stop the oiler falling out. The whole exercise needs to be repeated for the other axlebox. 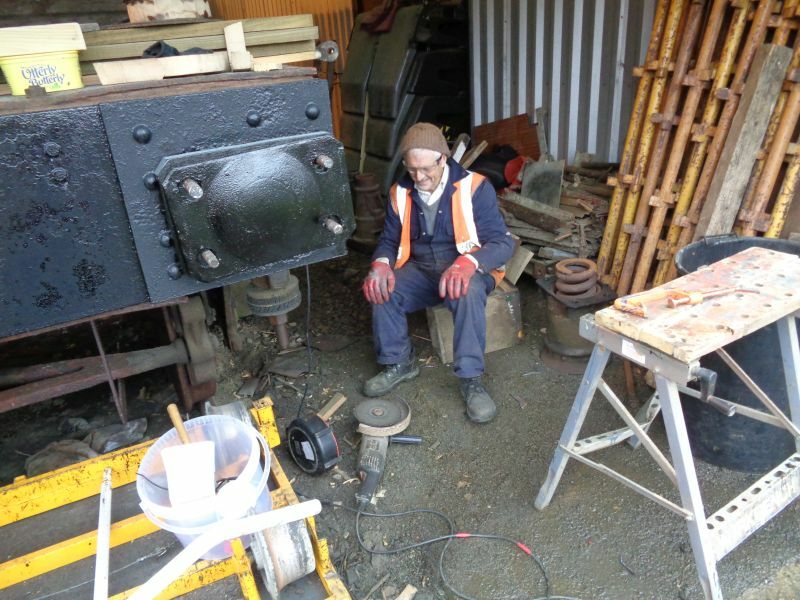 John Coxon after grinding off the distorted bottom plate of an axlebox. It's been a while since there's been an update, but it's a good one! 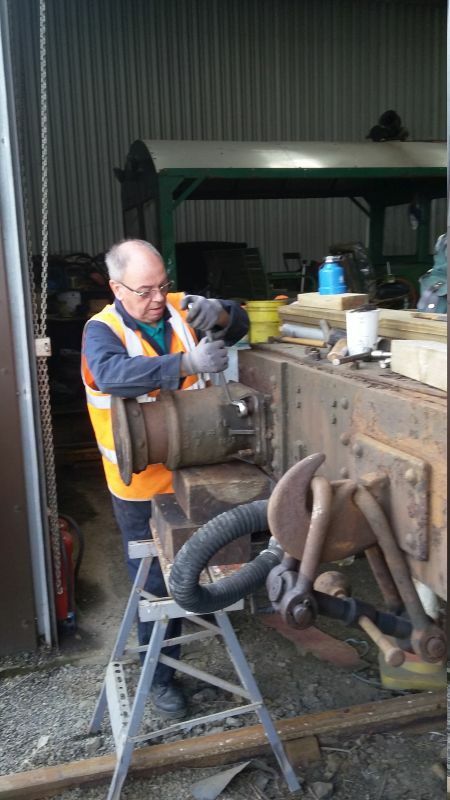 After much searching by numerous friends of DRSA, Geoff Horner tracked down a replacement axlebox bearing at the South Devon Railway, and collected it today. 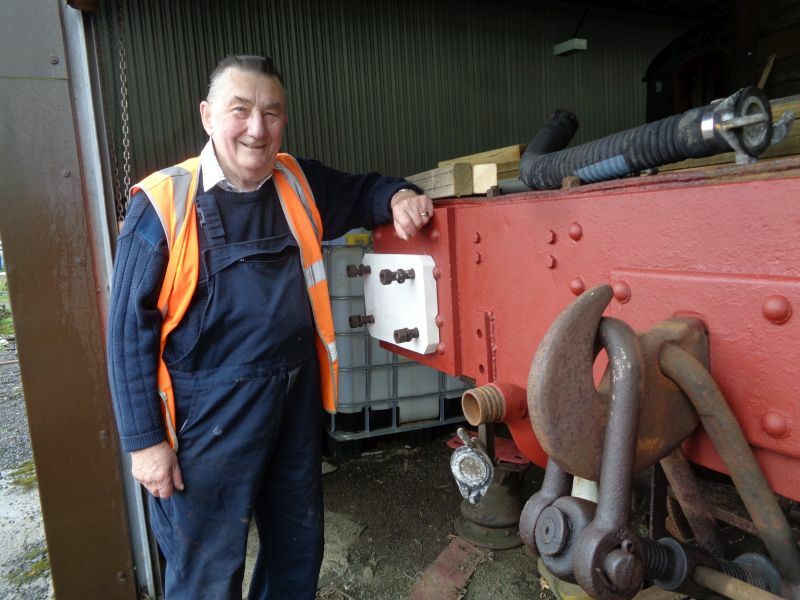 John Coxon continues to make progress with the bent axleboxes, so pretty soon we'll have the wheels going round again. Now all we need is brakeblocks. 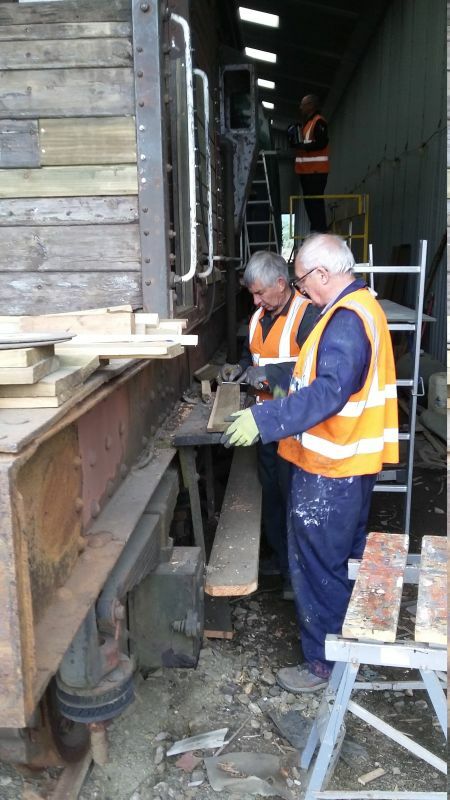 No longer sitting on blocks, and some progress has been made stripping the damaged and rotten woodwork. 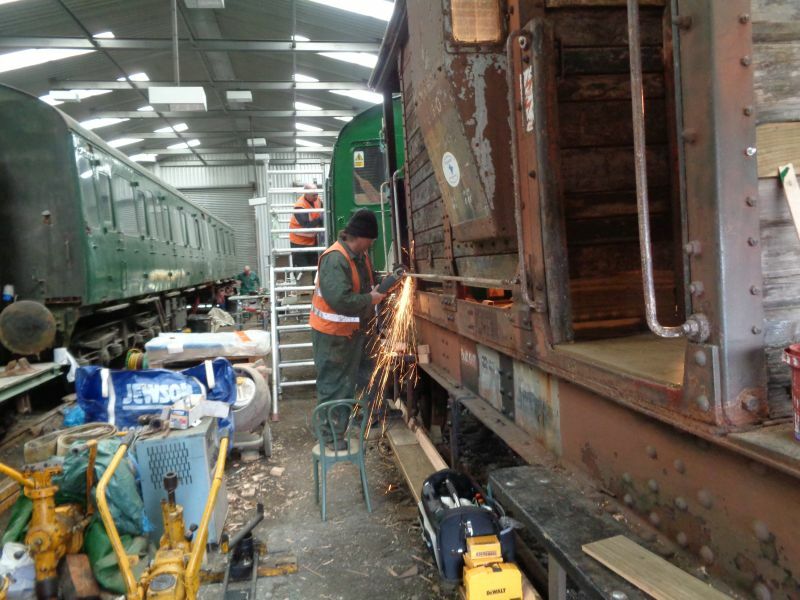 Work in progress with one of the van's axlebox issues. 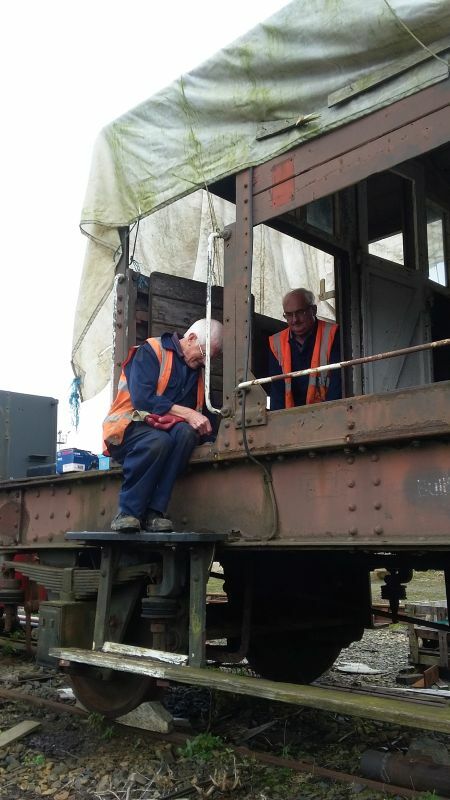 Patrick Doyle and John Coxon attacking yet another rusted-in bolt. 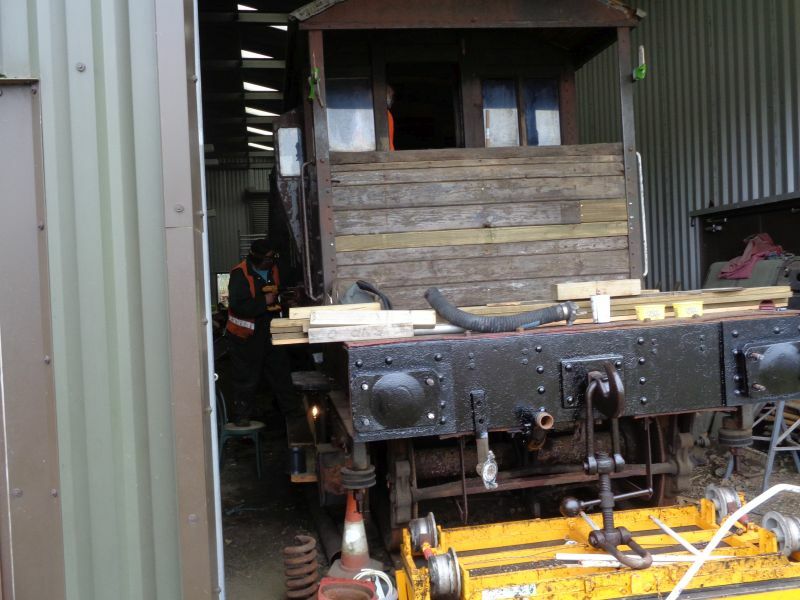 The brakevan is now in the workshop. 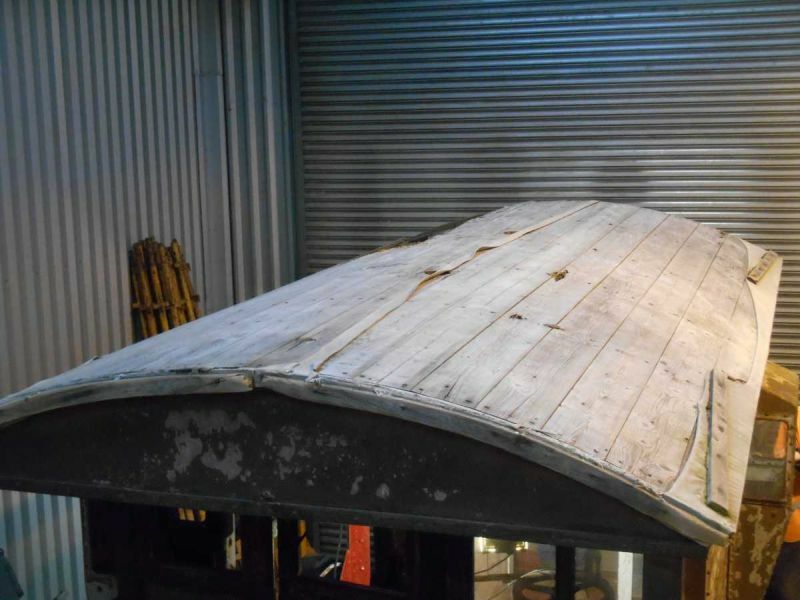 The roof stripped ready for some timber repairs prior to re-covering.